It was a Sunday noontime where the local mall nearby is normally filled with people when I watched HunterXHunter Phantom Rouge. There were moviegoers on the cinema floor but I and only another movie viewer which I don’t know watched this HunterXHunter film on the first slot for the day. Thanks to SM Cinema for showing and planning to show anime or manga based live action and animated movies like Samurai X, Naruto, and One Piece. 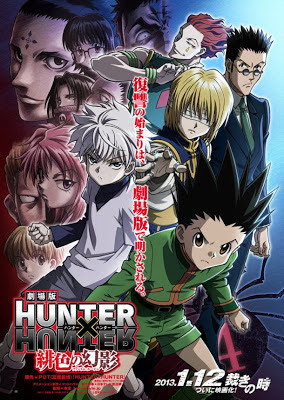 As for HunterXHunter, Phantom Rouge brings exciting new twists to the well loved anime. The introduction offers a reference for those who have no idea about the movie. Gon introduces his friends Killua, Leorio, and Kurapika complete with background info. He even mentioned Hisoka, the Phantom Troupe (Spider or Genei Ryodan) and the Hunter exam. After a short intro, the twists started pouring in. Who is the Phantom Rouge? It’s the former #4 with his spider numerical symbol still tattooed on his palm, Omokage, who calls himself a puppet master god, even building a church of puppets. His puppets are alive and can be copied directly from living and once living humans. His collection included Illumi, Killua’s older brother; Pairo, Kurapika’s old childhood friend before the Spider troupe annihilated their entire clan; his own younger sister Retz, who became friends with Gon and Killua; and his former Spider team mates except Hisoka who beat him for the #4 spot. News about the existence of a living Kurta clan member reached Kurapika. Leorio accompanied him to confirm. Pairo, who used to be blind and was the reason why Kurapika wanted to explore the outside world to seek medication for him, took Kurapika’s eyes. The movie’s plot actually revolved around this incident. Gon and Killua journeyed to find the eyes while Leorio watched over Kurapika in the hospital. She could have been a pretty little teen but she is not living at all and is merely a puppet. Omokage had been in search for perfect eyes for her since he discovered his abilities. Retz’ natural kindness made it easy for her to be friends with Gon and Killua. Some may even mistake her for a love interest in the movie. She too is a puppet master who has Nen abilities to create life and soul in a puppet. Illumi warned Killua about friends who will eventually betray you or you will betray them instead. It was Killua who betrayed his friends at some point in the movie. It was the distraction from his dark past and his brother’s vile advices which caused his failure in a similar manner that he did not pass the Hunter exams in the anime. It’s his genuine and sometimes too naïve kindness which made him understand and accept Killua’s weakness despite his failures. He actually purposely let his eyes be taken by the Illumi puppet so he can find out Omokage’s whereabouts and plans although Retz initially brought him to the church where the puppet god dwells. The same old Hisoka which everyone loves is on the film. He warns Kurapika about Omokage because he thinks all four of them are un-ripened fruits he wouldn’t despicably want to eat yet. Yes, the entire Genei Ryodan is alive! They even helped clean up another, even a former Spider’s mess and have decided to put off dealing with the chain user (Kurapika) for another time. HunterXHunter Phantom Rouge is a must see for all HxH fans and you can still catch it on theatres while you can this week.